Holy richness, Batman! This stack was decadent and fantastic! Definitely a big hit. I wouldn’t have thought to put English Toffee with mangoes and caramel, but this combination works. At first I bought a pound cake to save time. Then, the night before the party, I decided to try the poundcake recipe in the back of the Stacks cookbook. Man, am I glad I did! This pound cake is mmm-mmm good. I put the batter in two 8 x 8 pans instead of loaf pans so that I would be sure to get evenly levened circles for my stacks. It took about 30-40 minutes off of the baking time, and the stack rounds were perfection. The dessert itself is quite rich and delicious. It’s a winner! I’ll be serving this one again. Assemble the stacks early in the day and chill. Spray 6 stack cylinders with vegetable spray and place them on a sheet pan. With a 3-inch cutter or stack cylinder, cut the pound cake slices into rounds. (You may have to piece the rounds together.) Spread each round generously with about 1 ½ Tablespoons mascarpone. Layer in the following order: 1 frosted pound cake round, 2 Tablespoons toffee, 2 Tablespoons mango, 1 Tablespoon caramel sauce, drizzled over the mangoes. Repeat. Press down firmly but gently and chill for at least 1 hour. To serve, slide spatula under each stack cylinder and transfer to a serving plate. 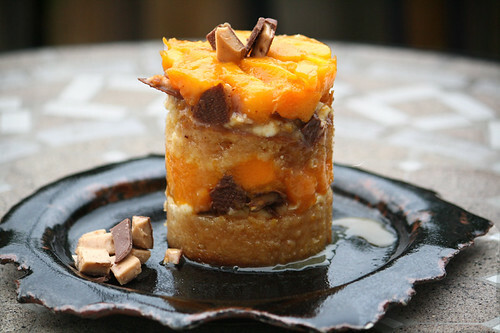 Unmold, drizzle with additional caramel, and top with any leftover mangoes and toffee. Dust the whole presentation with confectioners’ sugar and serve. Preheat oven to 350. Lightly grease 2 large loaf pans. With an electric mixer, cream together the butter and cream cheese until fluffy. Add the sugar and beat 2 to 3 minutes. Add the lemon juice, vanilla, and zest. Beat well. Add the eggs, one at a time, beating well after each addition. Add the flour and salt and blend until smooth. Pour into prepared pans and bake for 1 ½ hours or until a cake tester inserted in the center comes out clean. Cool in pan for 10 minutes, then turn out onto a rack and cool. -Purchase a quality caramel sauce. -A ready-made pound cake works well for this recipe. Place the sugar and water in a heavy saucepan and bring to a boil. Lower the heat to medium-high and cook, stirring occasionally until liquid turns a deep amber. Remove from the heat and very carefully stir in the cream. (It will bubble madly, just keep stirring!) Stir in the Cointreau. The sauce can be stored in the refrigerator 1-2 weeks. Note: To make a classic caramel sauce, eliminate the Cointreau. This looks great – very elegant, and of course mango makes everything good. Oh, my. This looks veryvery decadent. I must make this. Now. Anything with mascarpone will have me come running. Your stack is done so beautifully! I love the flavors in this and playing with stacks myself. This one is beautiful! That is so elegant, and tasty too! What a wonderful photo and where did you get that gorgeous plate? so cute! Thanks Angelia for stopping by and saying so! I made those plates for Kate – isn’t she a lucky girl!? That looks awesome and delicious. what a pretty dessert! I love the presentation too well done! Looks so good!Such good layering as well. WOW! My mouth is watering. 🙂 This looks so good! mango and pound cake are two of my favorite things! who knew putting them together would be so delicious! I always enjoy a good round desert. Um, hell yeah! Now must create some over-the-top event to make this for. what an amazing looking thing. If you open a bakery in Vancouver, I’ll definitely buy this.